The Annual TiE Global Charter Member (CM) Retreat facilitates business and social networking with the TiE CM network of 3,000 TiE charter members from around the globe. The CM Retreat is an exclusive Event, meant for TiE Charter Members and their families, where TiE CMs meet old friends, discuss the charter of TiE, and foster closer ties within the TiE CM community. There will be several activities planned for CMs and their families; including Networking mixers, Inspirational speaker sessions, Sightseeing tours and Formal Awards & Gala Night ceremony celebrating excellence at TiE Chapters around the world. The Annual CM Retreat is a Destination Event where CMs can create lasting bonds with other accomplished entrepreneurs, CEOs, business owners and rising innovators. Our annual Retreat is set in one of the popular Game of Thrones filming locations of Dubrovnik, Croatia from July 4-7th, 2019 at the 5- star Rixos Libertas Hotel. Due to its sunny coastline and gorgeous scenery, Croatia has been steadily gaining status as a Popular tourist destination. Croatia opens up the doors to a Mediterranean holiday of a different kind…. where you’ll find fragrant fields of lavender, crystal blue sea, vineyards, olives, grilled fish, and heady wine. There is also an element of discovery in the different island towns we will see – such as Cavtat and Elaphiti islands. During the Retreat, we’ll have special Entertainment and Networking gatherings every night – the Welcome Dinner, Awards Nights and Farewell Night atop of the Karaka Sail Boat. It is the one-of-a kind, all-inclusive vacation. CMs and their families are sure to have a fantastic time at the Retreat. We are planning excellent Speaker Sessions, Team-building games for the family, Business sessions, TiE-related Discussion Topics and of-course plenty of Outdoor adventures and Networking opportunities. Please refer to the Itinerary in the pink box below in order to book your flights and make your travel plans to Dubrovnik, Croatia. 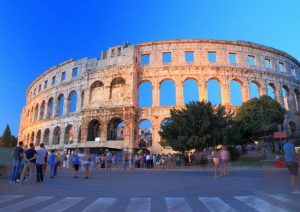 We can assist in organizing pre-tours or post-tours to explore various towns in Croatia like Zagreb, Plitvice Lake, Zadar, Šibenik, Split (all seaside cities) with great restaurants and sightseeing options. You can also take a trip to see the captivating beauty of Bosnia-Herzegovina. A day trip to Venice is only 3 hour Boat ride away. Combine your trip with a cruise to Venice or Greece in the Mediterranean or take a ferry along the Croatian coastline to get to Venice in Italy. You can opt to see the famous monuments of Mostar and Kravice Waterfalls in Bosnia. Visit the famous olive oil farms and vineyards in the Istria region, one of a kind Pula Ampitheatre or the Plitvice Lakes National Park. Only 10 days remain for the Early Bird Offer, so don’t delay in registering yourself and your family. The Retreat offers a great meeting place to meet and spend time with several Luminaries, Philanthropists and Angel Investors in the TiE Network. We will have great outdoor adventures, inspiring Speakers sessions, Team building games for the family and . discussions on bettering our organization. Rest assured, you’ll meet the our extended TiE Family and enjoy a pleasant holiday together. Our trip is well timed so you can catch some ICC Cricket World Cup action, or see some matches at Wimbledon in Britain. And if Golf is your cup of tea, the British Open is around those dates too.